Latest MIUI 8.2.17.0 China Stable ROM is now available for Xiaomi Mi 6 phone. Mi6 is the most recent flagship from Xiaomi, and the phone is already released in the market. Now the latest Mi 6 Stock Firmware is available for the Download on the Mi Servers. 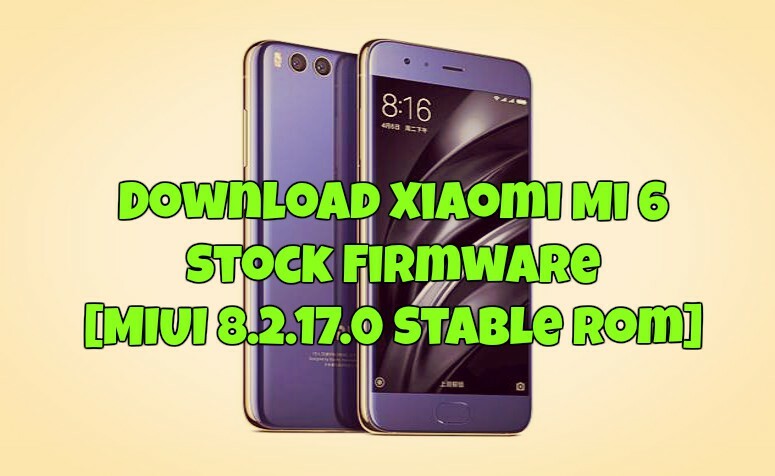 If you rooted your MI 6 or tweaked your phone and want to go back to the Stock firmware of the MI 6, then here is the full guide which you can use on Xiaomi Mi 6 and install the Latest Mi 6 Stock Firmware [MIUI 8.2.17.0 Stable Rom] on your phone. All you have to flash the ROM with the help of Recovery or Fastboot method. All the flash instructions are mentioned below in the tutorial. Stock Firmware is always useful when you soft bricked your phone or rooted your phone and want to go back to the factory settings. Then Stock firmware is the best option to go back to stock Firmware. Today here in this guide we provide you the link to Download MIUI 8.2.17.0 China Stable ROM for Xiaomi Mi 6 which can be flashed manually. Read all the steps very carefully and follow all the steps one by one on your phone. This guide is only for the Xiaomi Mi 6 users and don’t apply this method on any other Xiaomi phones., otherwise you will brick your phone. The process is simple and all it takes a few minutes to complete the whole process. There are two methods which you can follow on your MI 6. First is the recovery Method and the Second one is the Fastboot Method. To do this use the below method to install the MIUI 8 update on your device. This is the best way to download and install MIUI 8.2.17.0 ROM for Mi 6 and flash it. Comment below if you have any questions.